As a result, the transformation typically starts switching to a "big-bang" type of change as patience starts running out and new challenges to the transformation starts slowing down progress. This where organizations often get into trouble. The J-Curve is the amount of disruption/pain an organization goes through when change happens. If you are starting/going through a Lean/Agile Transformation today, this approach is worth considering if you are facing a few of the challenges I discussed. I'll blog more about the specifics for how we are applying the Kanban change approach in a current large-scale transformation in a later blog post. Great post. Very congruent with the Marshall Model. Although, the Marshall Model explains my problem with the latter half of your post (incremental change through e.g. Kanban). Yes, one CAN make incremental small changes to improve things, but these small changes often have little success in changing the mindset of the organisation - which ime is a necessity for SUSTAINED transformation. This post ( and Kanban) doesn't stand alone, Alexis and I use Kanban as more of a change catalyst framework. It gathers data, and males outliers amd bottlenecks obvious. Micro changes generated garner significant improvement, and culture does shift thanks to the changes in work. We have been complementing Kanban with classical Kotter steps of change, but top down change is informed by Kanban data. We call it the gardener model. Plants will do what plants need to do to thrive, and no one can create exact plans for every plant (Kanban), but the overall layout of the garden and the nurturing of the garden can be structured and directed (Kaikku). "3. Improve flow" gets interesting when the team starts to push against problems that are both outside of their control and likely to be common to multiple teams (i.e. not project-specific). I like the idea of having some pre-agreed escalation mechanism for these issues that is visible to transformation team but intended to outlast both it and its pilot projects. It helps to set an expectation for ongoing change and creates opportunities for engagement at multiple levels in the organisation. I should add that I've seen these issues managed in a Kanban system. Set up by one of your colleagues too! Absolutely Mike. These are the problems that the team(s) are usually well aware of but is hard to change so they avoid it. By visualizing them through Kanban it becomes something that is hard to ignore. It lines up well with Cotters heart of change by helping everyone "see" and this typically starts invoking emotions, the "feel" part as data highlights the impacts even more. 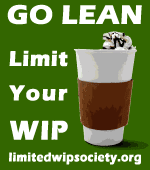 WIP limits act as another catalyst to start solving problems.